"Jaws," directed by Steven Spielberg, was made for about $7 million. It opened 35 years ago this week. This week marks the 35th anniversary of the movie "Jaws"
(CNN) -- The mechanical shark rarely worked, but everything else did for "Jaws," Steven Spielberg's 1975 thriller that set the standard by which all summer blockbusters have since been measured. The movie, made for about $7 million, opened 35 years ago this week. 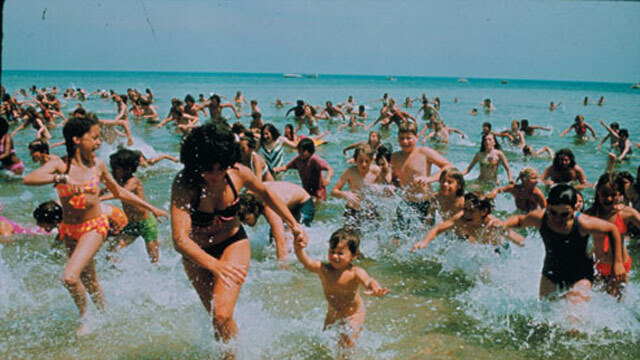 Decades and nearly $500 million dollars in ticket sales later, "Jaws" still jolts audiences out of seats, has fans reciting the classic lines -- "You're gonna need a bigger boat" -- and leaves beach-goers wondering if it's safe to go back in the water. "It doesn't look dated," said film critic Jeffrey Lyons. "It preys upon a fear that millions of people suppress when they go in the ocean. I told Spielberg I have never gone in the ocean since." Set in the fictional community of Amity and shot on Martha's Vineyard, "Jaws," based on Peter Benchley's best-selling book, tells the story of a police chief (Roy Scheider), oceanographer (Richard Dreyfuss), and crusty fisherman (Robert Shaw), on the hunt for a killer great white Shark. "It is amazing what effect it had then and now," said Ted Grossman, who was the stunt coordinator for the film. "That element is truly frightening. You are totally unprotected when you are in the water with a shark." While nervous studio executives fretted about production delays and the film's young director, Shaw, who died in 1978, had a feeling "Jaws" would be big. "Robert Shaw saw the dailies," said Grossman. "And he told [the producers] 'I waive my salary if I could get a piece of this thing.' I don't know what he saw but he saw what nobody else saw." When it premiered in June, 1975, "Jaws" was met with long lines and mixed reviews. Variety hailed it "a commercial and artistic smash," but the New York Times said, "It's a noisy, busy movie that has less on its mind than any child on a beach might have." Thirty-five years later, "Jaws" is recognized as one of the all time champs, a Hollywood classic ranked among the best ever by the American Film Institute. "I just thought it was a movie being made -- period," said actress Lee Fierro. "It never occurred to me at the time that it was going to so iconic." Fierro plays Mrs. Kintner in the film, whose son, Alex, is pulled under by the shark. Mrs. Kintner later slaps Chief Brody in the face for not closing the beaches. Fierro recalled hitting Roy Scheider about 17 times while filming that scene. "I slapped him hard with a loose wrist, which was what I was taught in acting school," she said. "One of the takes, I mistakenly made Roy's glasses go flying." Like Fierro, Susan Backlinie didn't imagine "Jaws" would have such a lasting impact. "They didn't know if it was going to flop on its face," she said. Backlinie is Chrissie Watkins in the film, the blond whose twilight skinny-dip conveys the suspense and terror of "Jaws" without ever showing the shark. "I think it's a movie that scares people to death and people like to be scared when they are not going to be hurt," Backlinie, now retired as a stuntwoman and actress, said from her home in Malibu, California. When the shark pulls Chrissie under the water for the last time, Backlinie said it was Spielberg who was at the controls, yanking a cable attached to her. "He [Spielberg] was really young and I was really nervous because he had wanted somebody from New York and they kind of forced me on him," she said. The same couldn't be said for Spielberg and the studio executives. "He was under amazing pressure to pull it off," Grossman remembered. "They were going to postpone the movie." Grossman, who worked with Spielberg on many films, said the three stars were pivotal in turning "Jaws" into a masterpiece. "Everything fell into place because the actors really pulled it off," he said. "They became those characters. They meshed together really well." Grossman didn't just perform stunts in the film. He was also the guy in the rowboat who becomes a meal for the shark. The scene was originally going to be far more graphic, Grossman said. "I got in the shark's mouth and they were taking me under the water, on top of the water, and there was blood all over the place," he said. "And then I grab the kid and drag him under with me, but it was so shocking, they did it just with the kid's point of view, with his eyes wide open and they went back to my leg dropping in the water." "The combination of not having a shark and John Williams' music was a winner, because it created this suspense," said Fierro, who said she still gets recognized by fans. "It certainly did change my life." For Spielberg, he feared the film would ruin his life. He described the shoot as a nightmare and thought his career was over. Given the success and influence Spielberg had since "Jaws," that clearly did not turn out to be the case. But some doubt the movie would make the same splash in today's world of computer generated imagery and effects. "It wouldn't be as good because it would use computers," Lyons said. "It would be too easy visually and you would see the shark much more often. "It didn't have to be 3-D. It's not always necessary. It was just an absolute experience seeing the film." Grossman said people still tell him they won't go in the water. "It all goes back to 'Jaws,' " he said. "It really had an incredible impact on people."